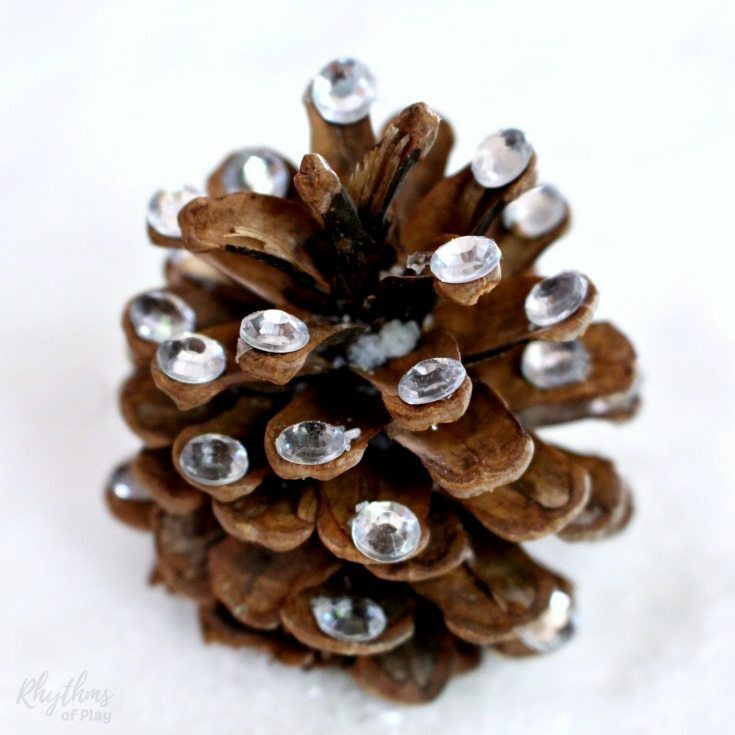 Add a little bling to your holiday decorations with this rhinestone pinecone craft! 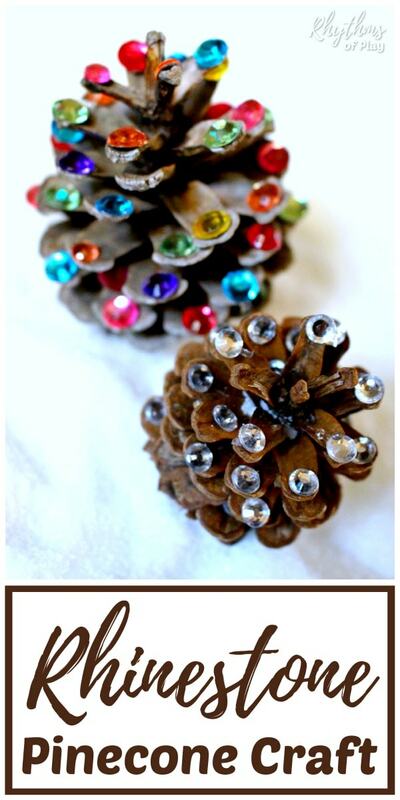 Making rhinestone pinecones is a fun fine motor activity for kids and an easy nature craft for adults. 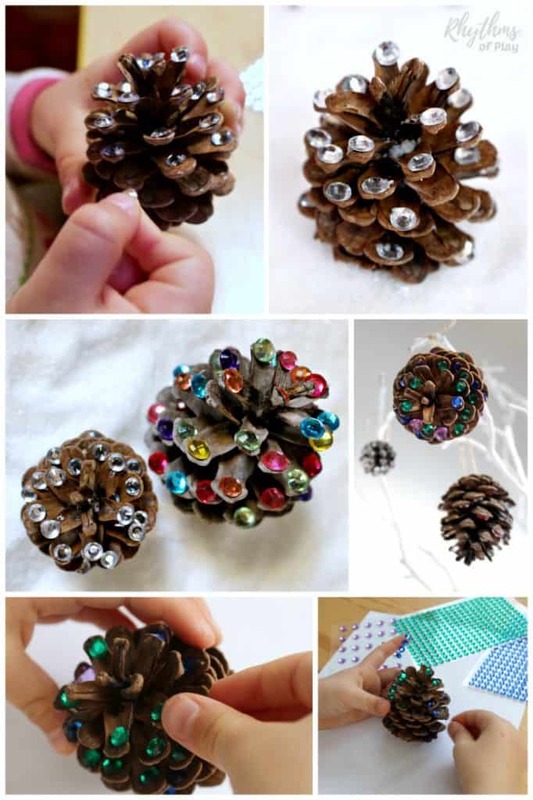 Pinecone crafts with rhinestone stickers can be made into Christmas ornaments, used to make a pinecone garland or placed in a bowl and displayed as DIY winter home decor. 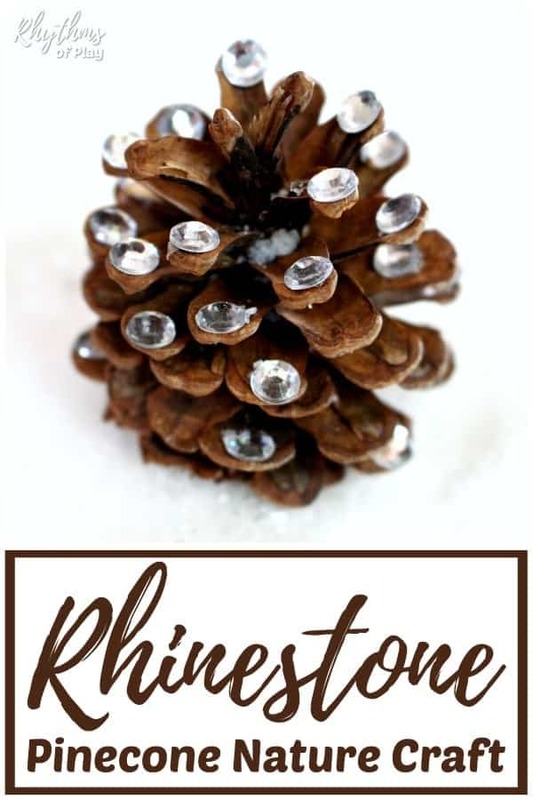 This post gives directions for helping little ones make rhinestone pinecone crafts as a fine motor activity to develop the fine motor muscles in the hand. Placing rhinestone stickers on pinecones helps develop the fine motor muscles to prepare for writing. Please note: The self-adhesive rhinestones are small and can be a choking hazard to the little ones. Make sure your child is mature enough to handle small parts before offering this fine motor craft. Invite the kids to go on nature hunt to gather pinecones to make pinecone crafts. There is an option to purchase a bunch of pinecones to make pinecone crafts if you can not find pinecones where you live. You can offer this activity to your children so they can practice their fine motor skills and glue them on later if desired. They don’t have to know that you “fixed” them. Please note that these rhinestone stickers fall off. If you would like them to stay attached use a glue gun or craft glue. Glue guns are hot and dangerous tools. Using a glue gun is not recommended for young children. Older children can use them under the direct supervision of an adult. 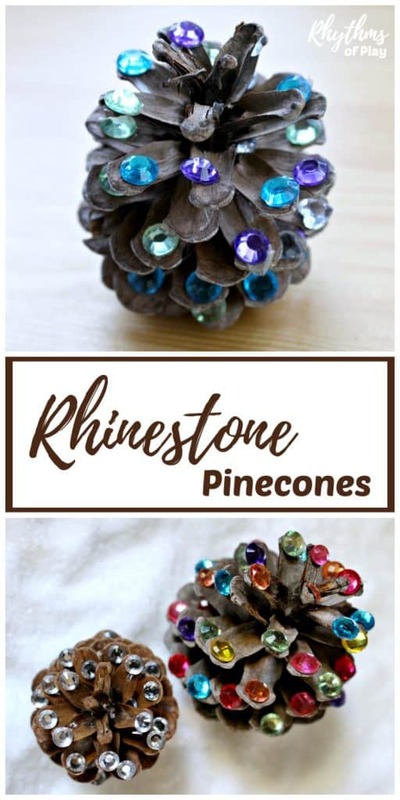 There are many things you can do with rhinestone pinecone crafts when they are complete. Place rhinestone pinecones on nature tables, display them around the home in decorative bowls as DIY winter home decor, or make them into a Christmas wreath, garland, or rhinestone pinecone ornaments for your Christmas tree. 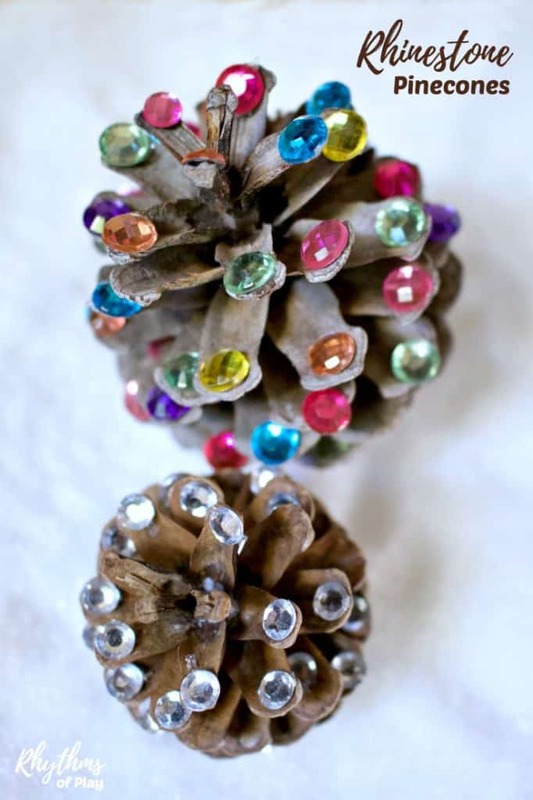 Make rhinestone pinecone crafts with the kids this winter. Creating pinecone crafts is a great way to spend time connecting with your children over the holiday break. Placing rhinestone stickers is also a great way for children (and older adults) to strengthen the fine motor muscles in the hand. There are so many things you can do with rhinestone pinecones once they are finished. You can place rhinestone pinecone crafts on nature tables, display them around the home in decorative bowls as DIY winter home decor, and make them into Christmas wreaths,f garlands or rhinestone pinecone ornaments for your Christmas tree. You may also like nature crafts and art ideas made with natural materials, and don’t forget to have a look at our Winter Bucket List Seasonal Activity Guide for more fun ideas!